From left, Burlington Mayor Miro Weinberger, Gov. 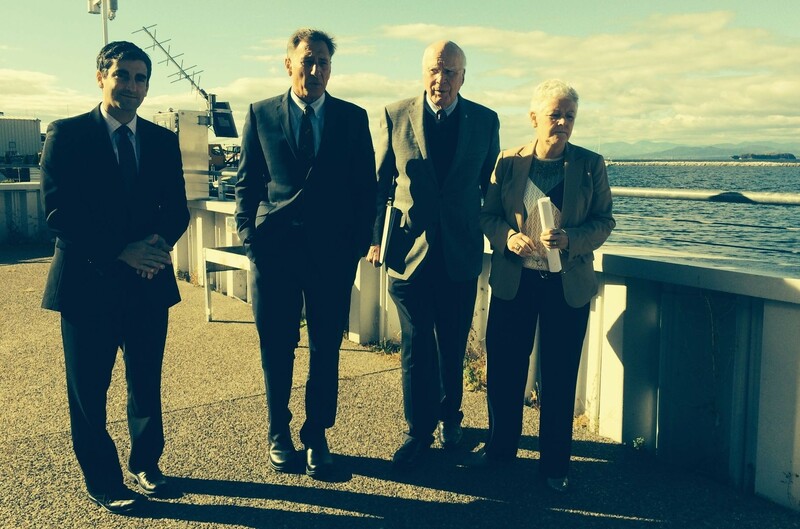 Peter Shumlin, Sen. Patrick Leahy and EPA Administrator Gina McCarthy walk into ECHO Lake Aquarium and Science Center. Environmental Protection Agency Administrator Gina McCarthy visited Burlington this morning to unveil a small planning grant to help the city curb pollution runoff into Lake Champlain, and said her agency hopes to make a much bigger lake cleanup announcement in spring. McCarthy, appearing with Sen. Patrick Leahy (D-Vt.), Gov. Peter Shumlin and Burlington Mayor Miro Weinberger at ECHO Lake Aquarium and Science Center, announced that the city had won a $67,000 grant from her agency to develop plans to reduce Burlington's impact on the lake. "I'm happy to be able to put a little bit more money into the pot," McCarthy said. "Work on the ground doesn't work unless you plan first." More significant news about Lake Champlain cleanup is likely several months away. Earlier this year, Shumlin submitted a water-quality plan to the EPA, detailing how the state would reduce runoff into the lake. The EPA rejected the state's plan in 2011, after the nonprofit Conservation Law Foundation filed a federal lawsuit decrying the lake's poor water quality. Concern about lake pollution grew this summer when a large algae bloom overran St. Albans Bay. McCarthy said the EPA is still reviewing the plan and expects to have an answer in the spring. Shumlin said the plan requires a significant federal investment. "It's about farms and farm runoff, its about development and development runoff, it's about roads ... " Shumlin said. "It's taking the data we have showing us where the most egregious challenges are, and saying, 'Lets prioritize where the pollution is happening and get change.' Vermonters will pay up, but we also need the federal government's help." McCarthy acknowledged she was unveiling only a "small grant," but said she hoped it would renew focus on the need to clean up the nation's waterways. "We need to bring all the attention that we can to it," McCarthy said. "I'd like to think the challenge in Lake Champlain is unique. It's not. We see nutrient blooms threatening waterways across the country."